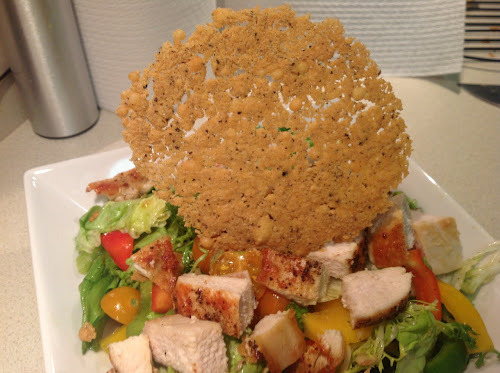 I rarely put croutons in salad anymore, but sometimes I'd like something crunchy in there. Nuts can do this somewhat, but it's a different sort of crunch. I do, however, like cheese in my salad. Frico is a way to have the best of both worlds. 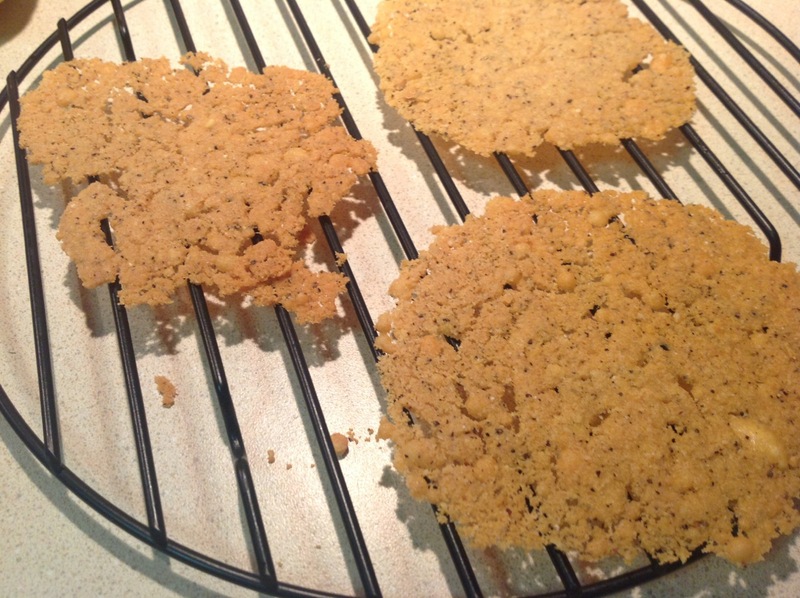 It's a homemade parmesan cracker that's easy to whip up in under 15 minutes. Be careful with them--they are very delicate. Preheat oven to 375 F. Place a nonstick liner (like a Silpat) on a baking sheet. Combine cheese, flour and pepper and spoon onto sheet into three evenly spaced mounds. Use a spatula or the back of the spoon to flatten the mounds into rounds of about 4 inches in diameter. Bake until golden, about 10-12 minutes. Allow to cool for a couple minutes and then very carefully transfer to a wire rack to cool completely (be careful, they break really easily). Weren't these inspired by a salad at the Crossing at Casey Jones? Sort of. Casey Jones serves their Caesar Salad with a parmesan tuile, at least according to their menu. I've seen recipes for tuile that are identical to frico and some that are pretty different, so it's hard to say whether they are exactly the same thing. Either way, it's a disc made mostly (or exclusively) of parmesan.